Posted on August 11, 2012 by Deli Lanoux, Ed.D. 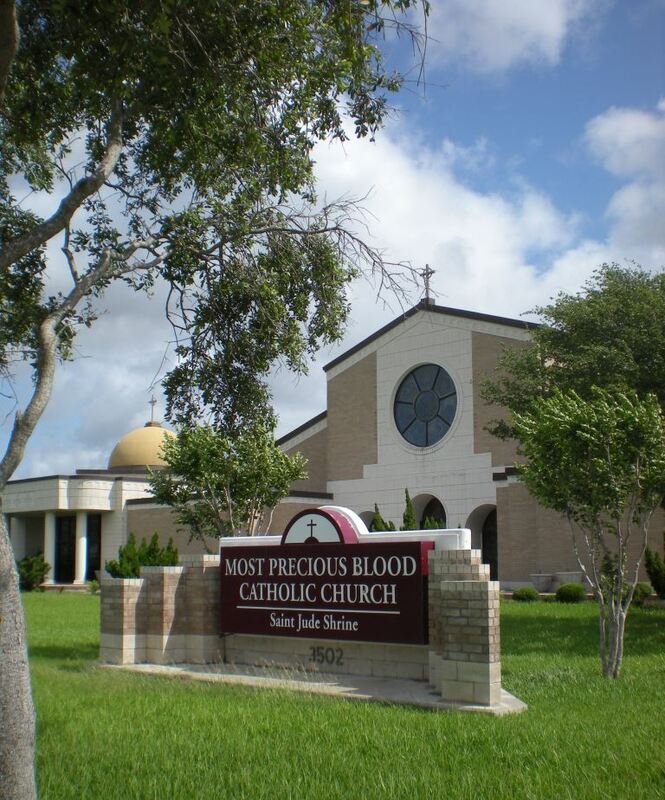 Early this morning, I received a timely response from the very personable Deacon Sebastian Landagan regarding one of the statues at the St. Jude shrine, which is part of Most Precious Blood Church (MPBC) in Corpus Christi, TX. 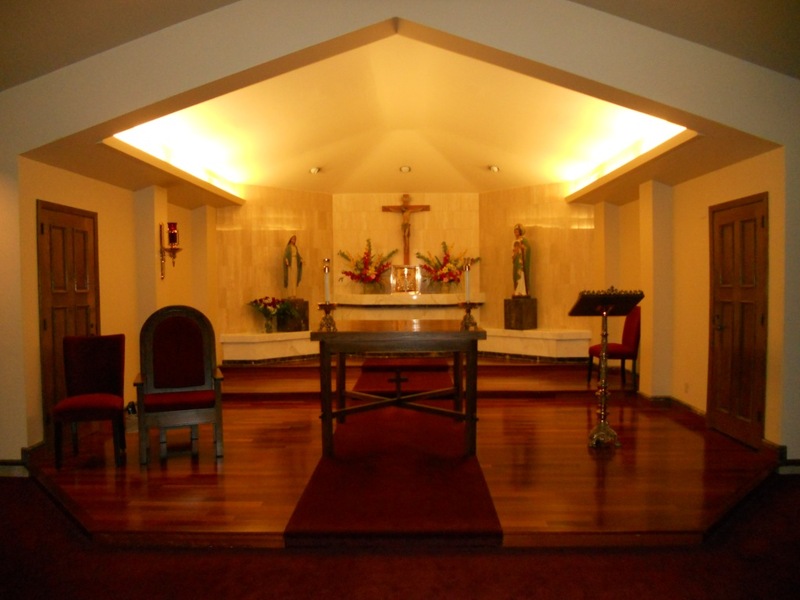 We had such a wonderful, memorable time at your church that I eagerly await the day we can be there again…. 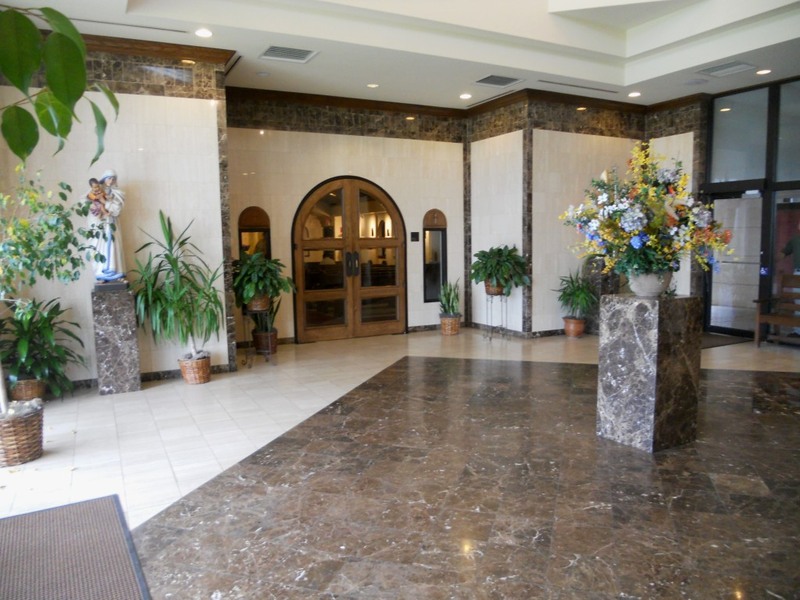 Thanks to Steven calling David Castillo about a stone cross… David extended an invitation we just couldn’t pass up. And there we were, making more memories, meeting sweet folks like you. To me, it’s all about building community within God’s kingdom. On that note, I’ve been alternating between Squawking Chicken Mode and Octopus Mode, so I haven’t yet gotten around to writing a post on our experience at MPBC on June 30. Still, that’s the plan, especially since I now have more photos of your church. Woohoo! Which brings me to a burning question. I was revisiting the photos I took at the St. Jude shrine, and I’m not sure about one of the statues…. I’ve attached the photo in case you have time to enlighten me. I know St. Rita holds the cross, and St. Teresa is in the church. But I’m stumped on this other one. The statue you were not sure about is St. Clare of Assisi. It is said that when an army of Frederick II was pillaging the valley of Spoleto, an ancient city in Perugia, Italy, some of the soldiers placed a ladder against the convent wall to try to overtake the convent. St. Clare asked to be carried to a window; and, holding the monstrance with the Blessed Sacrament in sight of the enemies, she prostrated herself before the Eucharist. Her prayer was heard, and the enemy panicked and fled in terror. Oh, my goodness. What a wonderful— unexpected— story from you this beautiful morning! Thanks so much! I’ll be sure to include your anecdote on my blog. I hope your weekend is peaceful, productive, and fulfilling! God bless you most abundantly. And thank you for all you do for all of us, Deacon Sebastian! Of course, I couldn’t leave the story there. Nooo! Not I. I had to find out more so, naturally, I went into search-and-find mode again. 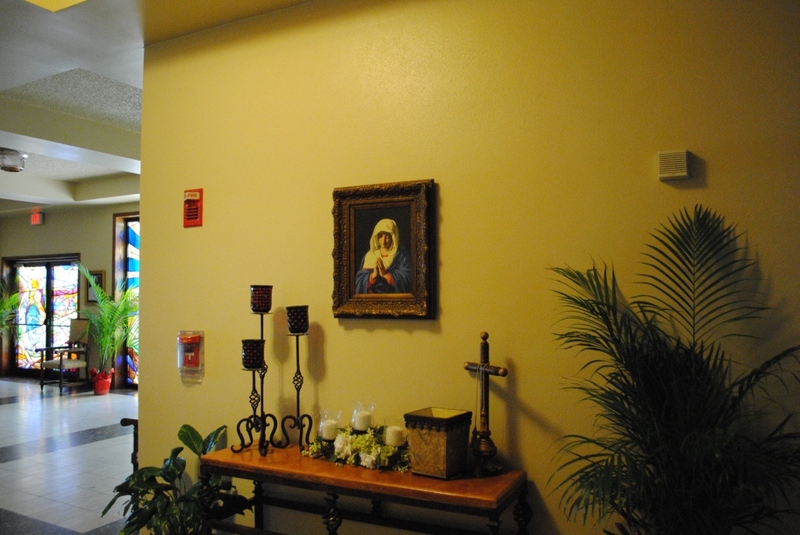 I decided to add Deacon Sebastian’s story to my “words to ponder” page along with a photo of St. Clare; but the more I read online, the more intrigued I was. I couldn’t stop. Then, boink! A title bopped me hard on the head. Died on this day. St. Clare of Assisi died on this day in 1253. I looked at the date on the web page, blinked, and then checked the date in the lower righthand corner of my computer screen. I hadn’t intended to spend the whole day writing. I’d had my heart set on beading Franciscan Crowns, reading the epilogue in Exile’s Return (Feist, 2005), baking bread, and just-plain doing my own thing today. Why, oh, why, oh, why would I do this to myself? Then, just like that, I succumbed to the moment. This is what God wants, and I’m fine with it. Sooo, “knowing how way leads on to way” (Frost, 1915), I proceeded to get my act together, recalling our memorable visit to Most Precious Blood Church recently. June 30, David Castillo, whom I’d met at the St. Jude Shrine two years before, invited Steven not only to Saturday evening Mass, but also to the lay ministers’ potluck afterwards. Of course, Steven insisted on dropping by the shrine first. Then I recounted the story of Tia Bordes, whose comments on my “St. Jude shrine” post sent me into search-and-find mode that day, but whose desire to find St. Rita burned deep within my heart. How I longed to help her! 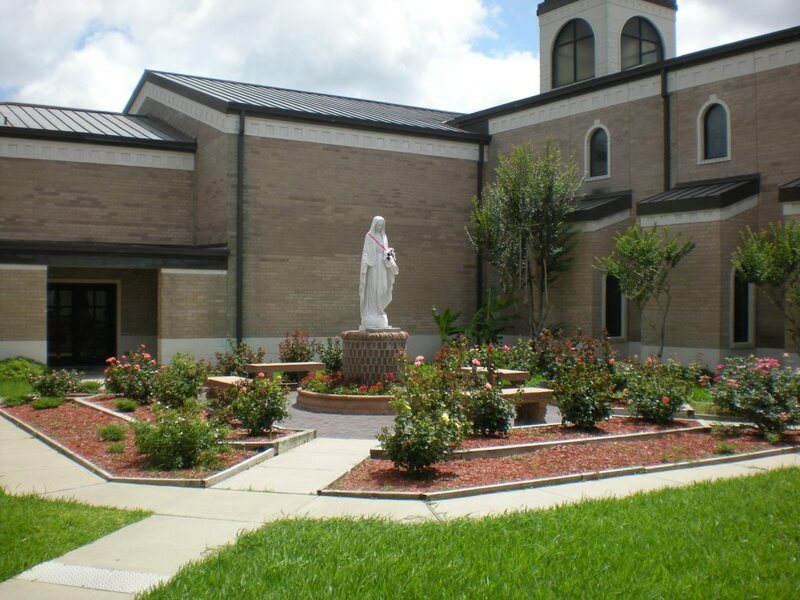 Could anyone give me the address of the St Jude shrine in Corpus Christi, please? It would make me and my father so happy to go there for a visit. Thank you, and God bless you. 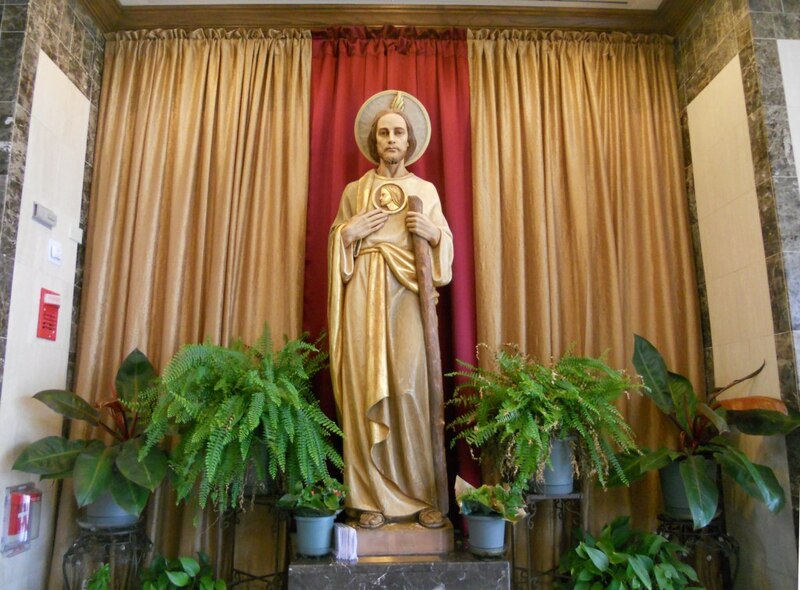 Dear Tia, your question reminded me of my first time looking for the St. Jude Shrine, which is easy to miss unless you know that the shrine is the golden domed part of Most Precious Blood Church. You can get to it easily either from SPID or, if you’re like me and prefer to avoid the traffic, take one of the back roads. I drove west on Holly, turned left on Weber, and then right on Saratoga. The church was about a mile or so down the road on my right. I don’t know which direction you’ll be traveling, but it should be very easy to locate. Just remember to look for A BIG CHURCH. The gold dome will let you know you’re there. That’s the roof over the foyer where you’ll find St. Jude. 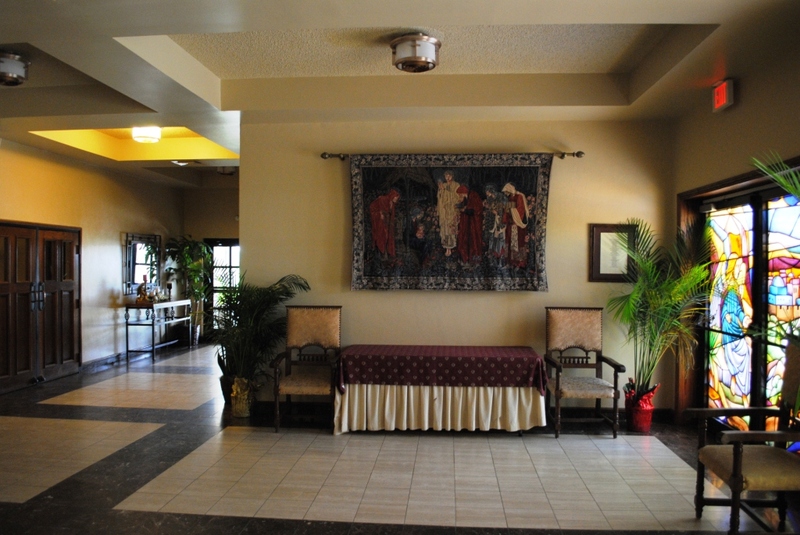 The shrine’s a beautiful, quiet place, perfect for contemplation; so enjoy your time there! P.S. 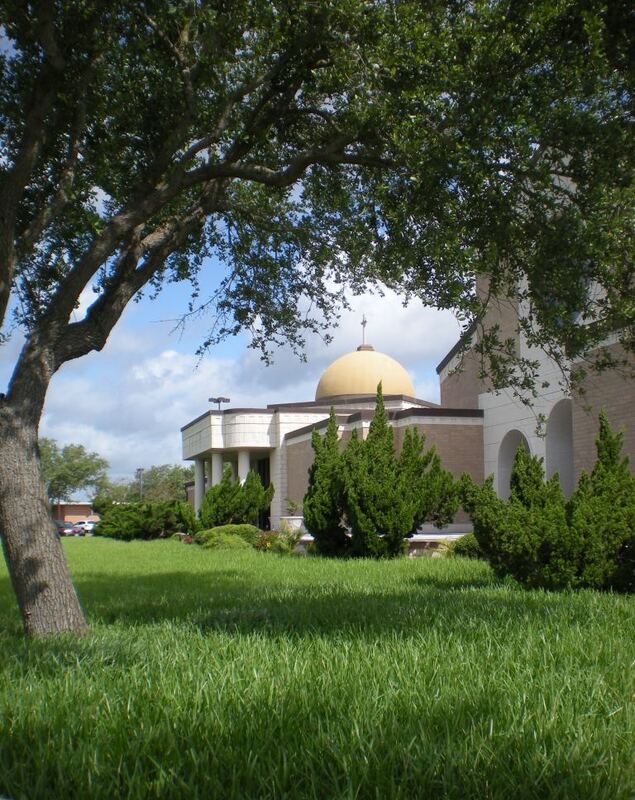 Here’s the address: 3502 Saratoga Blvd, Corpus Christi, TX 78415; and phone number: 361.854.3800. 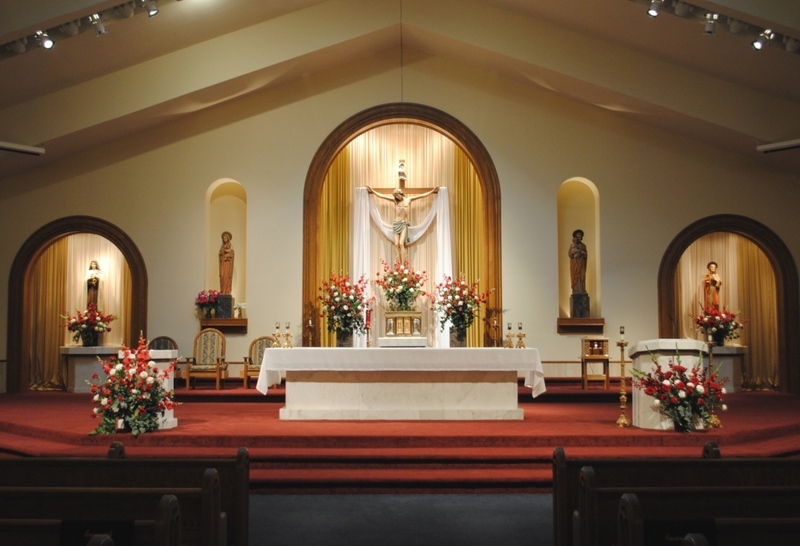 I also would like to know if there is a church devoted to St. Rita in Corpus Christi. Thank you for your help, and bless you. 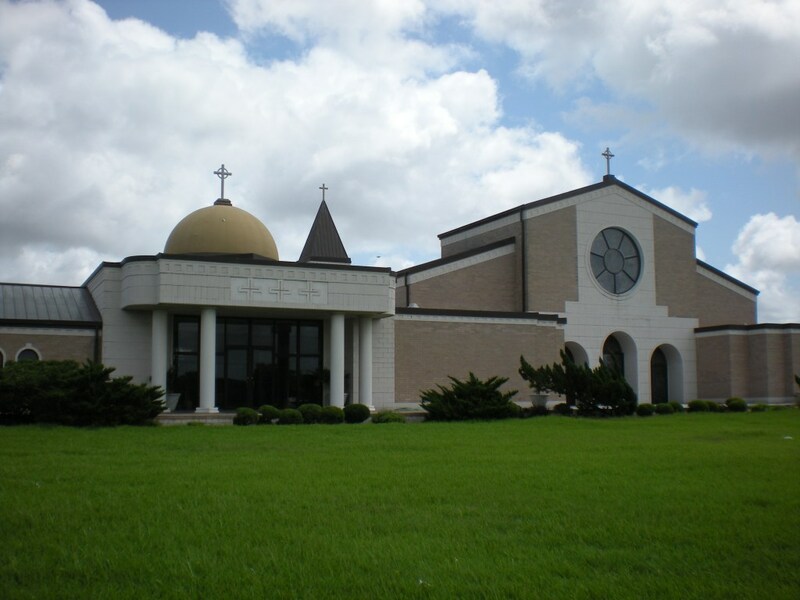 I checked the diocesan website and the internet for St. Rita Church and found none in the Corpus Christi (CC) area. 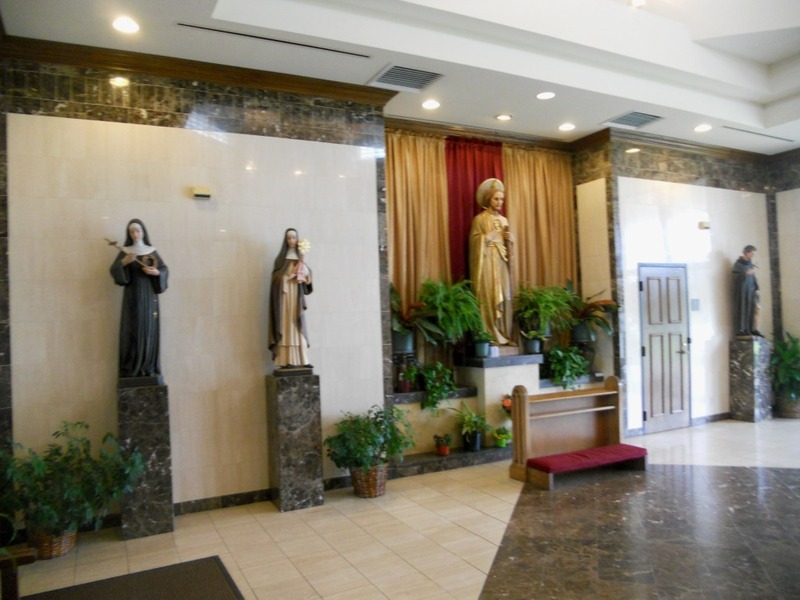 I also emailed a few friends in the CC area, and they wrote that the closest St. Rita Church is in Dallas. Alas, that’s too far, although Mary Ellen did send a link you might be interested in. As for devotions to St. Rita? None of us knows of a church that honors her with special prayers in the area, but you’ve inspired me to learn more to share later. So thanks! I had no idea which statues I’d find at the shrine ’cause David had mercilessly dangled the carrot and wouldn’t let the cat out of the bag. “If you want to find out, you have to show up,” he’d laughingly teased. Entering the shrine, I couldn’t believe how much had changed in two years— and there were five, not four, new statues waiting to have their pictures taken. I stepped over to the first statue and burst into oh-my-gosh mode when I read the name plate. 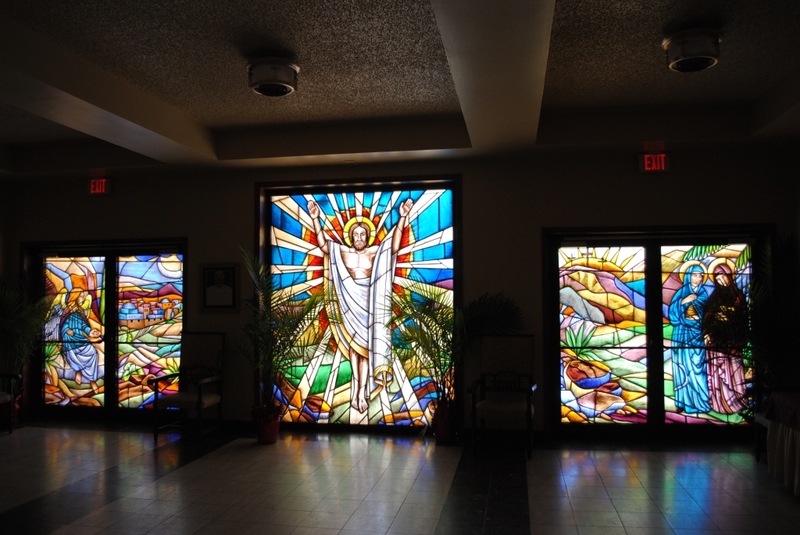 We were at Most Precious Blood Church for evening Mass yesterday, and guess what we discovered at the St. Jude shrine? A statue of St. Rita!!! Yes! I immediately thought of you. Sooo, I hope you and your dad visit the shrine soon! Saturday evening my wishes came true. Not only did I return to Most Precious Blood Church and the St. Jude shrine with Steven in tow, but I also discovered the saints I’d been waiting a long time to photograph. And I found St. Rita for Tia’s dad. Chaplet… Glorious St. Clare of Assisi, we honor you for the unfailing faith that made you reject all earthly pleasures, and renounce all of your possessions. We honor you for your life of extreme poverty and austerity, and for your prayer and penance on behalf of your nuns and the town of Assisi. Grant us dear lady, the same faith, humility, and charity that you have shown toward God and your community. Amen. Pray three Our Father’s, three Hail Mary’s, and three Glory be’s. For healing… O blessed St. Clare, your life shines like a beacon and casts its light down the ages of the Church to guide the way of Christ. Look with compassion on the poor and humble who call on you for help. As you bow before your Eucharistic Lord in heaven, speak to Him of my afflicted body and my broken spirit. Ask Him to heal me and to wash away my sins in his precious blood. Great servant of Christ, remember the needs of my family and all those I pray for. Defend us from everything that would threaten our holy Catholic faith. Hear the cry of the poor and make it a song of intercession, rising from your poor heart to the Eucharistic heart of Jesus, our healer, our savior, and our lord. Amen. Petition… O, glorious St. Clare! God has given you the power of working miracles continually and the favor of answering the prayers of those who invoke your assistance in misfortune, anxiety, and distress. We beseech you, obtain from Jesus through Mary, his blessed mother, what we beg of you so fervently and hopefully… mention your petition… if it be for the greater honor and glory of God and for the good of our souls. Amen. Chaplet… O holy St. Rita, exemplary Augustinian Sister, we honor you for your devotion to the passion of Christ. Although your early life was filled with disappointment, frustration, and unceasing tragedy, you never lost faith and trust in God. For this you are the patroness of the impossible, and our inspiration and advocate in desperate circumstances. Patroness of impossible causes… Dear Rita, wife and widow, you suffered a long illness with patience because of your great love for God. Your inspiration has prompted us to pray as you did; and we now invoke you for help, full of confidence in your powerful intercession. Come now to our aid for the relief and cure of this great problem…. To God all things are possible. May this blessing be a source of glory to the Lord. Teach us to understand that God’s love surpasses everything. Through your intercession may we be comforted in our sorrows. May we find that peace which only Christ can give; and, if it be God’s holy will that our sufferings should continue, we pray that we will be able to bear them with courage and faith. Dear St. Rita, do not abandon us. Pray with us until we obtain the blessings we ask in this time of great need. Amen. Petition… Holy Patroness of those in need, St. Rita, so humble, pure and patient, whose pleadings with thy Divine Spouse are irresistible, obtain for me from the crucified Christ my request…. Be kind to me, for the greater glory of God, and I promise to honor you and sing your praises forever. Oh, glorious St. Rita, who miraculously participated in the sorrowful passion of our lord, Jesus Christ, obtain for me the grace to suffer with resignation the troubles of this life, and protect me in all my needs. Amen. We become what we love, and who we love shapes what we become. If we love things, we become a thing. If we love nothing, we become nothing. Imitation is not a literal mimicking of Christ; rather, it means becoming the image of the beloved, an image disclosed through transformation. This means we are to become vessels of God´s compassionate love for others (St. Clare). “Love that does not know of suffering is not worthy of the name” (St. Clare). Glorious St. Catherine, virgin and martyr, help me to imitate your love of purity. Give me strength and courage in fighting off the temptations of the world and evil desires. Help me to love God with my whole heart and serve him faithfully. O St. Catherine, through your glorious martyrdom for the love of Christ, help me to be loyal to my faith and my God as long as I live. Amen. “Love God, serve God; everything is in that” (St. Clare). What you hold may you always hold. What you do may you always do and never abandon. But with swift pace, light step, unswerving feet so that even your steps stir up no dust may you go forward securely, joyfully, and swiftly on the path of prudent happiness (St. Clare). “Love that cannot suffer is not worthy of that name” (St. Clare). “Lean on your Beloved because the soul who abandons themselves in the hands of Jesus in all they do is carried in his arms” (St. Clare). “Love him totally who gave himself totally for your love” (St. Clare).